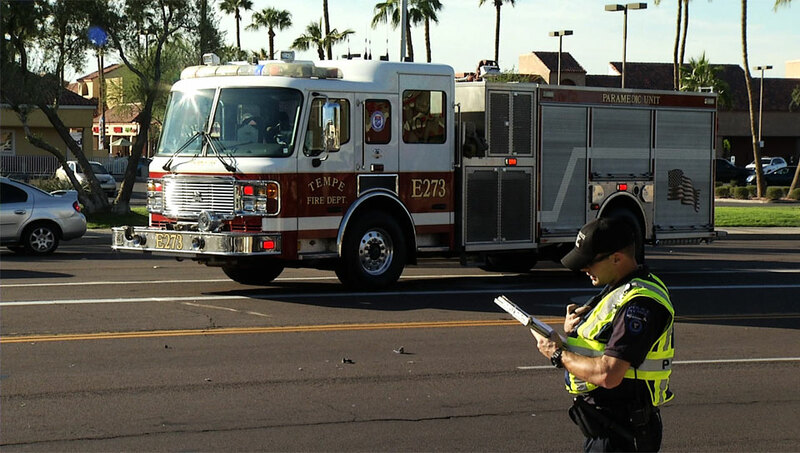 / Modified dec 19, 2013 1:35 p.m.
Every year, the Tucson Fire Department responds to an average of 80,000 calls for help. There are fires and car crashes; medical emergencies and “code arrests,” in which firefighters work to save the life of someone whose heart has stopped. Each call carries great responsibility, says Tucson Fire Health and Safety Captain John Gulotta. What first responders see can take an emotional toll, and that’s why many police and fire departments use crisis interventions to help their workers cope. One of the most common interventions is Critical Incident Stress Management, or CISM. It’s a highly structured system developed to help people recover from emotionally traumatic events. Although it’s sometimes used one on one, it often includes group discussions, called debriefings, to go over the traumatic event. Tucson Fire paramedic Kevin Chaffee came to know and train in CISM on the job, and says he has seen its benefits firsthand. Over the 13 years that followed that first call, Chaffee saw more than his share of emotional trauma as a firefighter. But one event changed his life—and his ideas about how best to respond to a crisis. A year ago, Chaffee’s closest friend was killed. His friend was a Nogales firefighter with close ties to his department and to the community. Chaffee says the CISM team followed the program’s protocol, including a debriefing and some suggestions for self-care—but that the implementation clashed with his and his fellow mourners’ emotional needs. That different road has led Chaffee, Gulotta and the rest of the Tucson Fire Department to develop their own alternative to CISM. It’s called the Peer Operational Support Team, or POST, and it has grown from a partnership with University of Arizona researchers, including psychologist Patricia Haynes, director of the UA Stress and Trauma Recovery Clinic. “It’s a peer system, where fellow firefighters go and talk with their peers who’ve gone through really tough calls, and the whole purpose in the short term is to really promote calming,” Haynes said. The trained firefighters who make up POST talk to their peers one-on-one and help them find ways to decompress, whether it’s by calling their families or taking a day off. Haynes says they make themselves available but let the natural recovery process unfold, checking in periodically to catch problems as they arise. POST’s informal, individualized approach differs from CISM’s, and it’s gradually gaining favor in certain circles. Some studies have suggested that CISM’s group debriefings have the potential to interfere with natural recovery. That has fueled controversy around the practice, and led the National Fallen Firefighters Foundation and some fire departments to move away from CISM. Tom McSherry is a former firefighter EMT who has implemented CISM all over the country for high-profile disasters including 9/11 and the Yarnell Hill fire. He says he stands by CISM, but understands the impulse to try something different. McSherry cautions against abandoning all the tools that CISM offers, because one-on-one interventions—like the ones favored in POST-like models—may not be enough when large-scale disasters strike. Firefighter Kevin Chaffee agrees. As part of the team developing and testing POST, he says he sees himself drawing from CISM to simply offer his fellow firefighters another choice when their burden grows too heavy.